Dr. Kenneth Banasiak utilizes innovative 3D technology to provide patients with enhanced convenience and precision in orthodontic treatment. 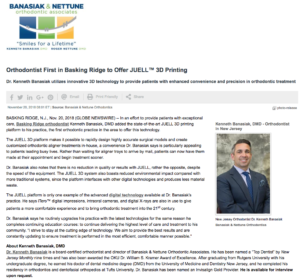 Basking Ridge, NJ — In an effort to provide patients with exceptional care, Basking Ridge orthodontist Kenneth Banasiak, DMD added the state-of-the-art JUELL 3D printing platform to his practice, the first orthodontic practice in the area to offer this technology. The JUELL 3D platform makes it possible to rapidly design highly accurate surgical models and create customized orthodontic aligners treatment in-house, a convenience Dr. Banasiak says is particularly appealing to patients leading busy lives. Rather than waiting for aligner trays to arrive by mail, patients can now have them made at their appointment and begin treatment sooner.